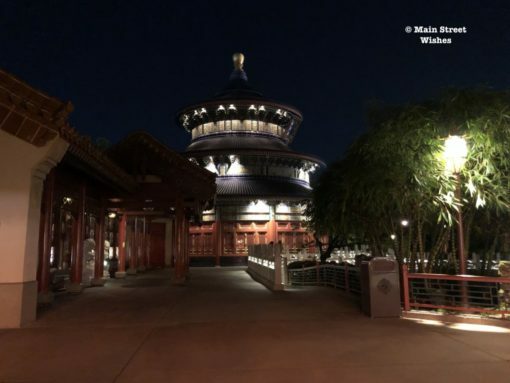 Yesterday, I asked for guesses as to where the lights in the above picture are located on Disney World property. There were some great guesses, and a couple of people got it right! The lights can be found in the quick service location in the China Pavilion, the Lotus Blossom Cafe. This was the first time I tired this dining location and I wasn’t disappointed. It’s not going to be the same quality as the sit down restaurants, but when you’re craving some pot stickers it’s a good place to stop. That’s pretty much why I ended up stopping there, I was waiting for the fireworks and was hungry, but didn’t want to do a table service restaurant. In addition to the pot stickers I tried the egg rolls and they were good too. The restaurant itself has a couple of dining rooms inside and part is open to the outdoors. There’s also some seating outside, which is where I ate. I liked sitting outside and having the views of the China Pavilion and the World Showcase. The restaurant is set back a bit from the main path along the lagoon, but it’s worth taking a walk in the pavilion and checking things out. 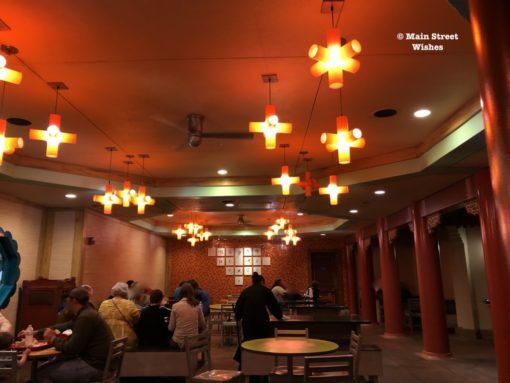 In addition to the Lotus Blossom Cafe, there are other dining options as well as shopping, activities, and live entertainment. That’s why it’s worth taking a walk into the pavilion, there’s quite a bit to see and do. There are also some great photo opportunities in the China Pavilion. It’s one of my favorite spots to take pictures, because of the landscaping and buildings. Thanks to everyone who played along this week and congratulations to those that knew where the lights are located! We’ll play again next Wednesday! 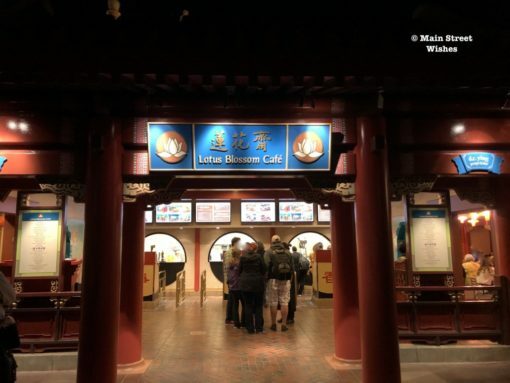 What are some of your favorite things in the China Pavilion? « Where is it Wednesday: Where on Disney World Property Are These Lights Located? 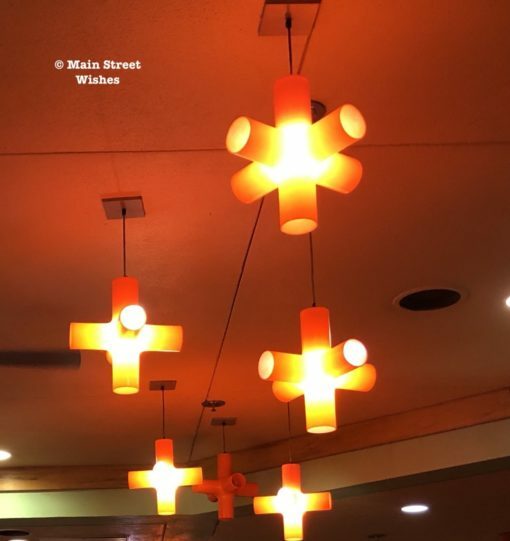 I thought those lights looked familiar, but I just was not sure. I just ate at that restaurant on our last trip in May. The orange chicken was good and I guess I spent most of my time looking down at my plate instead of up at the lights. We absolutely love Nine Dragons ! !